#RSU Admission List – The list of candidates offered provisional admission into the Rivers State University (RSU), Nkpolu – Oroworukwo, degree programmes for the 2018/2019 academic session is out. This is to inform all candidates who participated in the Rivers State University of Science and Technology (RSUST) 2018/2019 Post UTME screening Exercise that the management of the institution has released the names of candidates offered provisional admission. RSU admission list for the 2018/2019 academic session is now available online. 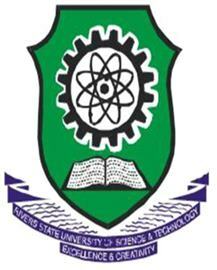 Go to RSU Admission status checking portal at http://ecampus.rsu.edu.ng/index.php. Locate the Admission List Section and supply your JAMB registration number in the appropriate column. Click on Go to load your UTME and post UTME scores. Finally, click on your registration number to access your RSU admission status. Finally, click on ‘Check Admission Status‘ to access your RSU admission status. Congratulations to all the candidates that made it to RSUST admission list for the 2018/2019 academic session.